At one time, many polls asked people for their occupations, which were then coded into groups. For example, Gallup used to classify people as farmers; business, executives; clerical; sales workers; skilled workers; unskilled workers, operatives; service workers; farm laborers; laborers, except farm and mine; and professional. They stopped around 1970. Since then, most surveys have asked about education and income, but not about occupation, so the "working class" is defined as people with low education or income. Thomas Edsall refers to a new survey by the Public Religion Research Institute that takes a different approach: it includes a question on how people are paid and defines the working class as people who are paid by the hour or the job and do not have a college degree. Defined by education, the mix of Democrats and Republicans in the working class was no different than the middle class. Defined by income, the Democrats had a lead in the working class (44%-39%) but were well behind in the middle class (39%-51%). With the other definitions, the Democrats do better in the working class, although the gap is smaller than when defined by income. There's some overlap between the different "working classes," but it's far from perfect. For example, about 40% of people in "white-collar" occupations (which I defined as professionals, managers, business owners, and sales representatives) lacked a college degree and about 20% of people in "working-class" occupations had one. No matter which definition you use, the Democrats do at least as well among "working-class whites" as among middle-class whites. Of course, you might argue that none of the differences are as big as they would be if working-class whites (or maybe middle-class whites) were following their class interests. But on a basic level, the Democrats don't have a particular weakness among working class whites. What's the matter with the "white working class"? As I've mentioned before, a lot has been written about "white working class voters" recently. A piece by Thomas Edsall is more informative than most, but it illustrates two common problems. First, small cities and towns in Pennsylvania or Ohio or somewhere in the Midwest are taken as representing the "white working class." Edsall's story, for example, starts by discussing voting trends in Lehigh County, Pennsylvania (Allentown and Bethlehem). But regardless of how you define class, any fair-sized town contains a mix of classes. And different places have different political inclinations--for example, parts of Pennsylvania and Ohio have a tradition of Republican voting that goes back to before the Civil War. So how a candidate is doing in any particular state or county or town may be an interesting question, but doesn't tell us much about how that candidate is doing among the working class. Second, when survey data is used, class is usually defined by education or income, since few polls today ask people what kind of job they have. Education and income are important influences on lots of things, but why call them "class" rather than, say, education and income? Of course, income, education, and occupation are all related, so maybe you wind up with pretty much the same group of people regardless of the exact definition--in my next post, I will consider this issue. Sometime after President Obama's "you didn't build that" speech, I read an interview with Paul Ryan in which he said that it reflected a "collectivist" philosophy which had dominated the twentieth century (more precisely, the first 80 or so years), in which the government tried to plan all economic activity. I don't remember the America of my youth as a centrally planned economy, but if I've learned one thing in my time as a sociologist, it's that opinions differ. So I looked for data on what kind of system Americans thought they were living under. The most directly relevant question is from 1965, when the Gallup Poll asked: "Which one of these of these terms do you think most closely describes our economic system--capitalism, moderate socialism, pure socialism, or communism?" 36% said capitalism, 31% moderate socialism, 3% pure socialism, 1% communism, and 1% said something else. You may have noticed that those don't add up to 100%: 27% said that they didn't know. The next question is how people who thought that we had a socialist (or communist) system felt about it. For this analysis, I set aside people who said some other kind of system, and combined those who thought we had pure socialism or communism. I kept people who said that they didn't know, since there were a lot of them. Unfortunately, there were only a few questions in the poll that seemed relevant. One was whether "you would favor or oppose helping the railroads to improve their passenger service by government financial aid." People who believed that we were at least partly socialist were more likely to favor the "collectivist" opinion, but people who said they didn't know what kind of system we had were even more favorable. Another question gave people a list of people who had been mentioned as possible Republican candidates for President and asked who would make "the best candidate for the Republican party in 1968?" (Everyone was asked, not just Republicans). I classified the names into three groups, moderate to liberal (e.g., John Lindsay, George Romney), conservative (e. g., Everett Dirksen, Richard Nixon), and very conservative (Barry Goldwater, Ronald Reagan). There was no discernible difference between people who thought we were living under capitalism or moderate socialism. The small minority who thought we were living under socialism or communism had more conservative preferences, although even among them moderates and liberals got the largest share. Finally, the survey asked people how they had voted in the 1964 election. People who thought we had a socialist system were more likely to have voted for Goldwater, but the difference wasn't that big. Overall, a lot of people thought that we had at least a degree of socialism, but they didn't seem all that worried about it. Another point that came out was that the connection between views on government aid to the railroads and candidate preference was surprisingly small (at least to me). 40% of Johnson's voters were in favor, and 38% of Goldwater's. 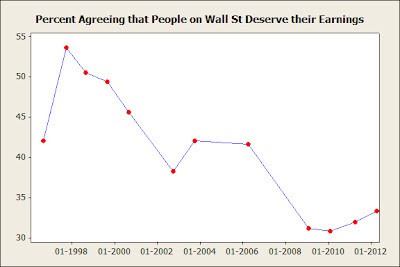 Since 1996, the Harris Poll has pretty regularly asked people if they agreed or disagreed with the statement: "Most successful people on Wall Street deserve to make the kind of money they earn." The following figure shows the percent who agree (of those who express an opinion--an average of 5 or 6 percent say that they don't know). There's no sign that the Occupy Wall Street movement affected public opinion--the number who agreed rose slightly between 2011 and 2012. As you might expect, the percent agreeing fell after the 2008 crash (and like the economy, recovery has been slow). But the decline between the late 1990s and 2006 was just as big as the decline between 2006 and 2009 (the 2009 question was asked in February, when memories of the financial crisis were still fresh). Maybe the bursting of the dot-com bubble was behind the change in the first years of the century, although I don't think that the average person was all that aware of it. Or maybe it was just a response to general economic conditions: when times were good, people didn't mind other people getting rich, but when growth slowed, they started to resent it. The basic pattern is the earlier the president, the greater the public sector job growth. There are a couple of departures from the pattern--public sector job growth was higher than expected under Johnson, and lower under Reagan. Obama is also unusual--the drop between Bush and Obama is bigger than the drop between Carter and Reagan. Taking all presidents together, there's no difference between Democrats and Republicans. 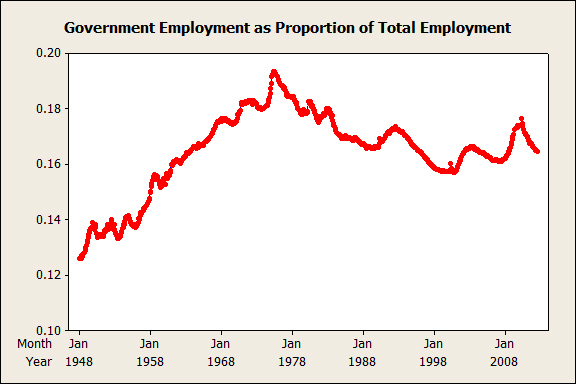 While I'm at it, here's a graph of government employment as a proportion of all employment. g=.03356+.1904x+.2676y+.1418y+.1402z, where g is predicted percentage change in private yemployment, x is actual percentage change last month, y is percentage change two months ago, and z is percentage change three months ago. Even though the model includes only the last three months, the more distant past still has an effect, because it influenced the values for the recent past. In fact, the effects of the past never completely disappear, they just fade away. I estimated the total predicted job growth over each president's time in office, given the job growth in the three months before he took office and subtracted that amount from the actual amount. Then I divided that figure by the length of time he was in office to put it in annual percentage terms. The resulting figure can be understood as the rate of job growth relative to what would have been expected. Two presidents come out substantially better under the adjusted rankings: Obama and Kennedy. Of course, the adjusted rankings aren't completely fair as a "grade"--employment changes are affected by circumstances beyond the president's control, and there are other important economic conditions. But the record of private-sector job growth under Obama is not unusually weak by historical standards--the recession was just unusually deep. Also, the difference in private-sector job growth between Democratic and Republican presidents is even stronger when you adjust for the conditions they faced when they took office. In address to the Democratic National Convention, Bill Clinton said that since 1960, 42 million private sector jobs had been created in the 24 years when a Democrat was president, and only 24 million during the 28 years when a Republican was president. A NY Times story called it a "startling truth" and "one of the most surprising statistics of the night," but concluded that "it appears to be true; it is backed up by a recent Bloomberg news analysis and federal labor statistics." It shouldn't really be surprising--the statistics come out every month and no one seems to question their accuracy, and the historical figures are available in convenient form from the Bureau of Labor Statistics. And even without looking up the numbers, anyone with a general knowledge of recent history knows that the economy did relatively well in the 1960s and 1990s. That led me to wonder about the performance of individual presidents. I give the figures in terms of average percentage growth per year while they were in office. Now that's what I call a surprising statistic--Jimmy Carter had the second highest rate of private sector job growth, easily beating Clinton and Reagan. Unfortunately for him, the growth came in the first three years of his term--it came to a stop just as the election campaign was getting underway. Another surprise is the low ranking of Eisenhower--people usually think of the 1950s as a period of strong economic growth. Obama doesn't come out very well, although he does finish ahead of George W Bush. Of course, the different presidents came to office in very different conditions, so the more important question is how well they did given the circumstances they faced. I'll talk about that in my next post. The survey I mentioned in my post of August 6 also asked: "On your deathbed, which ONE of the following will you most likely look back and think you should have done? 1. Taken more advantage of the years when you were single, 2. Spent money instead of saving it, 3. Been a better parent, 4. Quit your job, 5. Seen more of the world OR 6. Pushed for health care reform." The most popular choice was "seen more of the world," at 52%, followed by "pushed for health care reform" (15%), "been a better parent" (14%), and taken more advantage of your single years (9%). Few people chose the other options (6% had no answer, but unfortunately there's no breakdown into "don't know" and expecting to have no regrets). I was surprised that health care reform ranked so high--maybe it was because there was nothing else about doing good to people outside your own family. 21% of liberals chose "pushed for health care reform," compared to 18% of moderates and only 7% of conservative). Liberals were also more likely to choose taken more advantage of their single years (12%, compared to 10% of moderates and 6% of conservatives). Conservatives were more likely to choose "been a better parent" (21%, compared to 13% of liberals and 9% of moderates). The differences on parenting vs. single years might show something about the psychological bases of political views, but I suspect that they arise because a significant number of people understand "liberal" and "conservative" as referring to lifestyle, not politics.